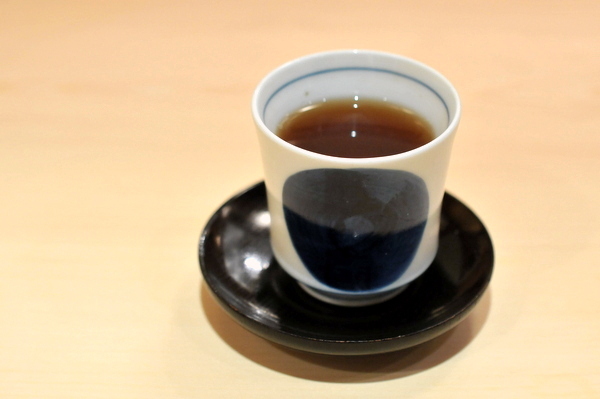 My first visit to Urasawa was supposed to be a once in a lifetime experience. Since then I've been back five times with the last trip coming a mere three months before this meal. After not blogging my last two visits, I figured enough time had passed to warrant another post. 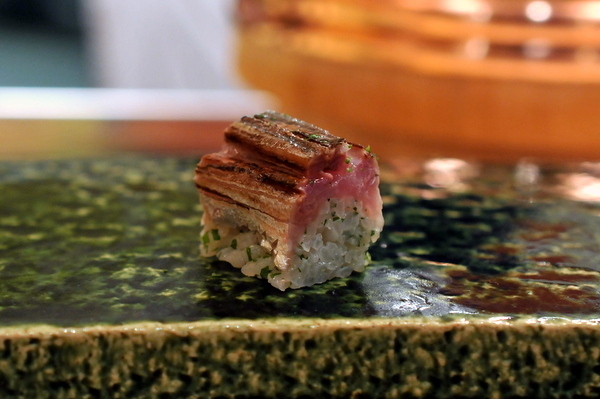 A humbler start than the toro tataki that often opens the meal but no less delicious and perhaps a bit more complex. The vegetables are each distinctive and delicious and when taken together have a beautifully refreshing effect, simultaneously smoky and vegetal with an overarching citrus twang from the yuzu "dressing." This dish showed off a deft sweet-savory tension that I quite enjoyed. 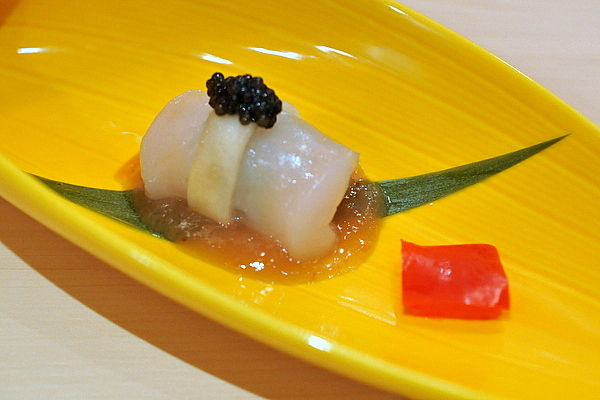 On one side was the plum sauce and arguably the sweetest raw scallop that I've ever eaten while the caviar and ankimo provided an unctuous and savory contrast that gradually overtook the sweet elements. We were advised to finish with the small square of pickled bell pepper; its bright vegetal tang acting as a palate cleanser. I had a similar course a couple visits back that featured a bit more seafood, but I thought this simplified version made the flavors feel more focused. 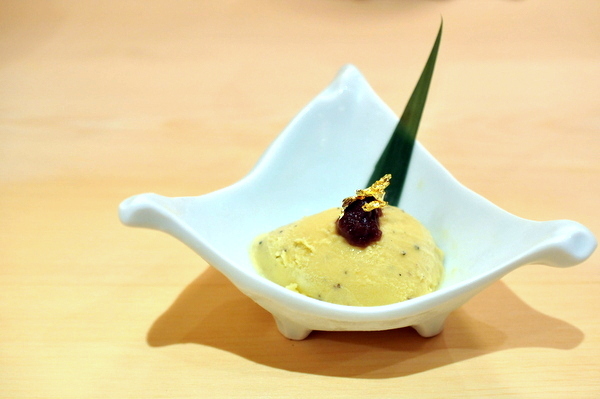 The tofu is delicate and creamy with a persistent nutty sweetness. 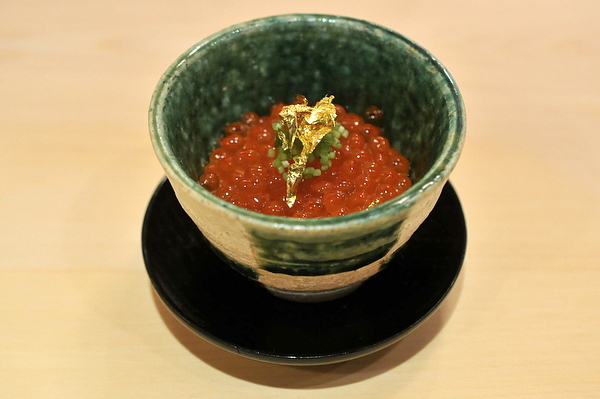 That flavor was unexpectedly heightened by the salmon roe which exhibited a gentle sweetness rather than the prototypical salinity. 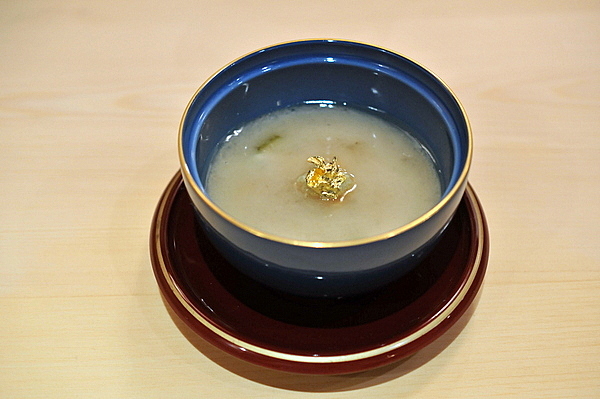 So far a relatively one dimensional dish, the dashi was key with its resolute umami essence. The tartare had a texture and flavor reminiscent of a slowly braised beef, smoky-sweet and immensely rich. 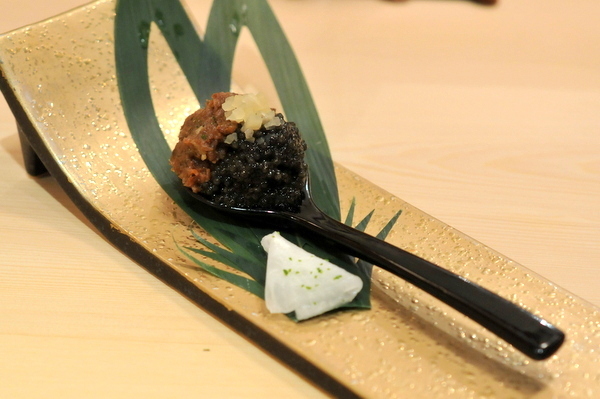 Like the earlier scallop course, the caviar provides a salty foil for the tender beef. Naturally this combination was more powerful than the earlier scallop-caviar pairing demanding the pickled radish to temper the sheer robustness. 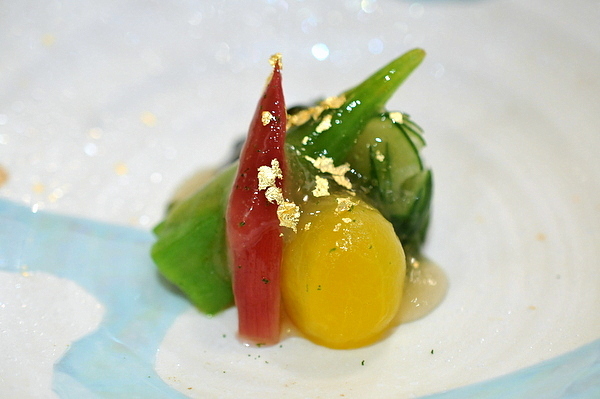 The yuzu-soaked sliver of daikon finishes the dish with a fruity yet bitter crunch. This dish featured a smorgasbord of ingredients. Texturally, the mucilaginous yamaimo stood out, its sliminess was a bit disconcerting for some of our party but I had no issues. Flavor wise, the slowly steamed ingredients all take on an even flavor but the lingering savor of the bonito showed most prominently. I'm not a huge fan of tempura but I absolutely adored this course. Inside the fluffy golden batter was a generously sized piece of abalone. 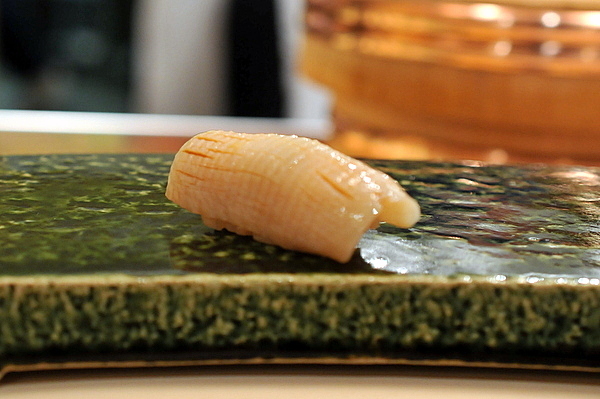 The prized mollusk is cooked for a long time giving it an incredibly tender texture, easily the softest abalone that I've ever eaten. 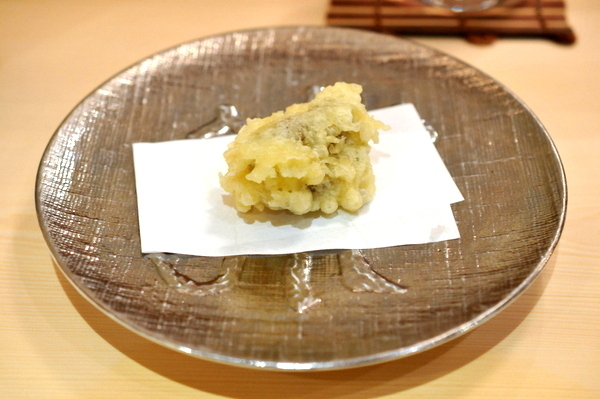 The subdued brine of the abalone and sweet fried sapor of the batter are both elevated by the savory sweet tentsuyu sauce. 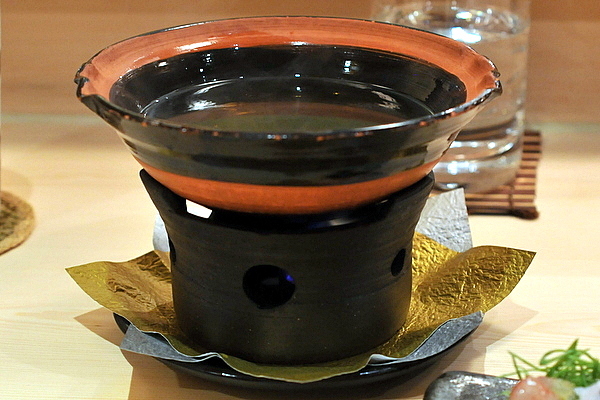 A lot of people considered the shabu shabu their favorite course and I can certainly see why. Lacking the artifice of some of the earlier courses, it is easy to appreciate the simple majesty of the pristine seafood with the bracingly tart dipping sauce. On deck tonight were a delightfully spry King Mackerel, and sublimely snappy Sweet Shrimp. 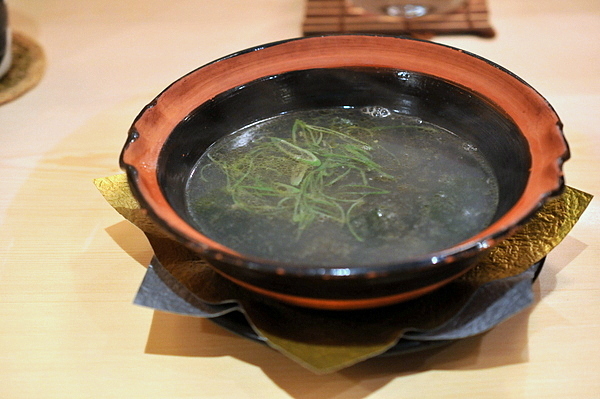 By this time the broth had picked up a delicate umami sapor from the shellfish and seaweed, and despite the summer heat I enjoyed every last drop. 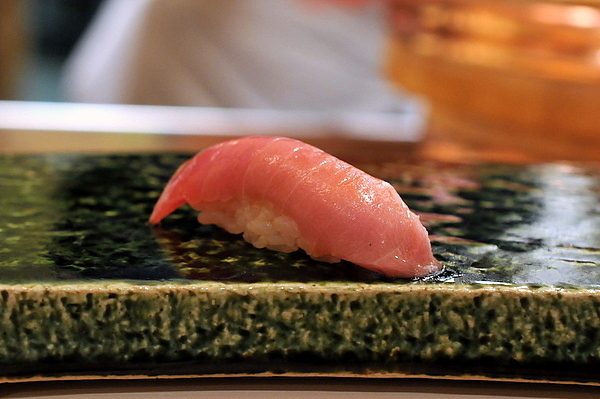 Hiro-san always starts the nigiri off with a bang. In terms of fish quality this was comparable to the sashimi, but I found the fatty tuna even better with the loosely packed warm rice. 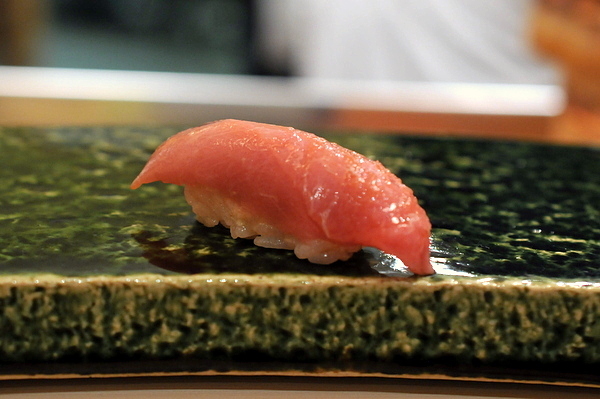 On the heels of the toro nigiri, we have a seared variation. The charring adds a smoky piquancy on top of the tender unctuousness. The majority of my party seemed to prefer the seared preparation but this time around I though the raw toro was superior. Surprisingly the rice was the most prominent element to start though the Makerel's oiliness became more apparent upon mastication. Texturally the fish was fleshy with a hint of snappiness. This is one of the most visually striking pieces of Tai that I've had in a while, warm pink flesh and pearly white skin thinly scored to tenderize the meat. 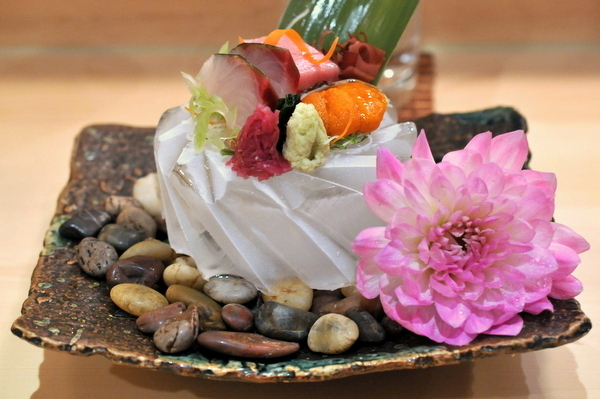 The fish itself is quite mild making spray of fresh yuzu juice vital. 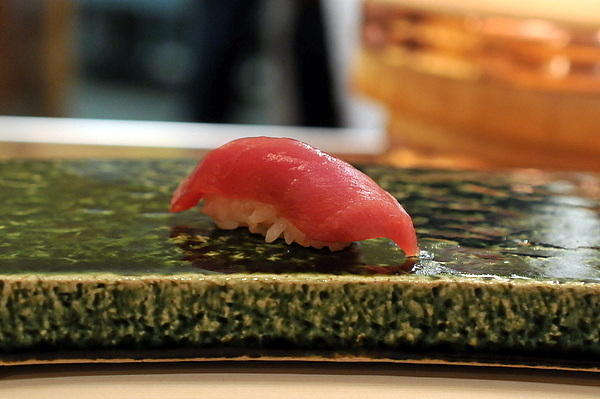 Maguro with its uniformly smooth texture and clean flavor is often considered the quintessential sushi, but as always it is difficult to appreciate the subtlety when compared to the expressive flavor of Toro. Now this is what I remembered, supple and oily but more nuanced than the Toro or Aji, the rice does make all the difference with its lightly warm temperature contrast. The slick flesh almost melts under pressure taking on a creamy consistency. 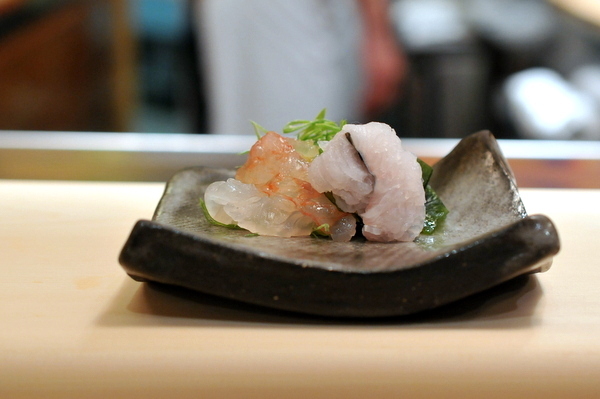 Relatively mild by nature, the squid relied on the mixture of salt and sudachi zest for flavor. I've always wondered where Urasawa-san got the inspiration for this dish. 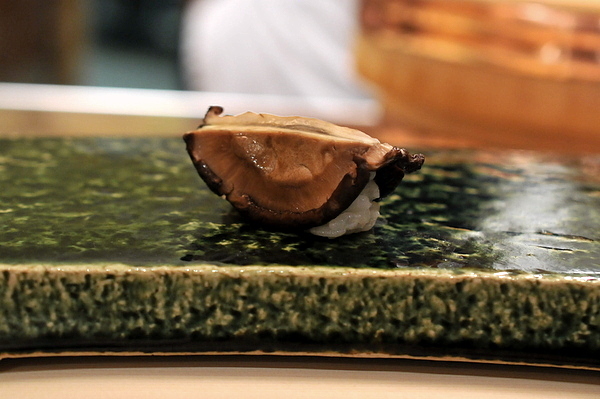 The piercing woody funk of the mushroom is so different from the delicate refined flavors of the other pieces. Typically less prized than O-toro, high quality Chu-toro still displays a sense of richness but balanced with the clean fishy smack of Maguro. 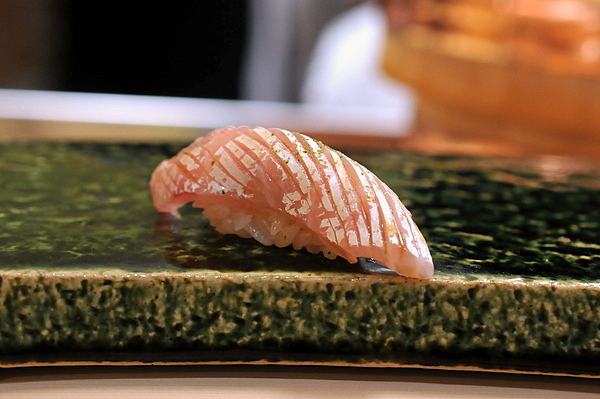 Tender but not overly unctuous, the nigiri feels more robust and complex than either of the two extremes. 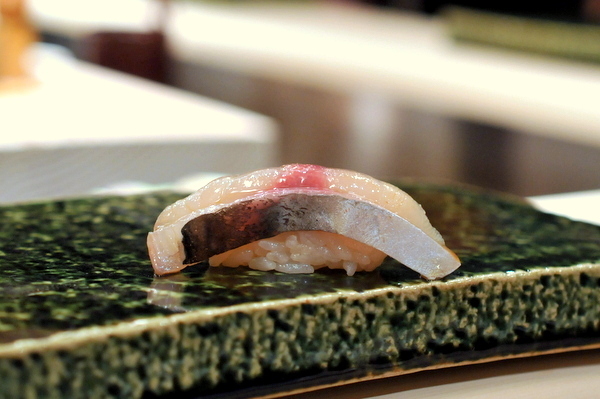 Underneath the silvery skin is one of the most flavorful types of sushi fish. Gizzard Shad is typically oily with a dry mealy texture, but this was a bit leaner than most and the fishiness wasn't quite so pronounced and had a lightly bitter cast to it. 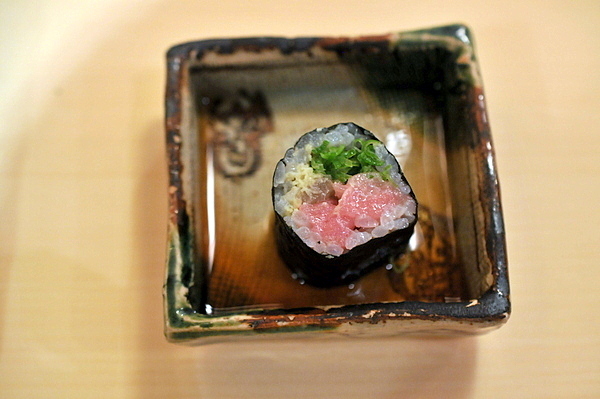 Despite its oily grandeur the toro isn't the star here, instead it is the way the accompaniments of crunchy tangy radish and nori counteract the gravitas of the fish that makes this so enticing. When I first tried Sanma I found the intensity a bit challenging so I would have never guessed that it would be my favorite nigiri this time around. Like my first time here Urasawa-san puts the thin fish over a bed of rice then uses hot metal rods to sear the flesh. 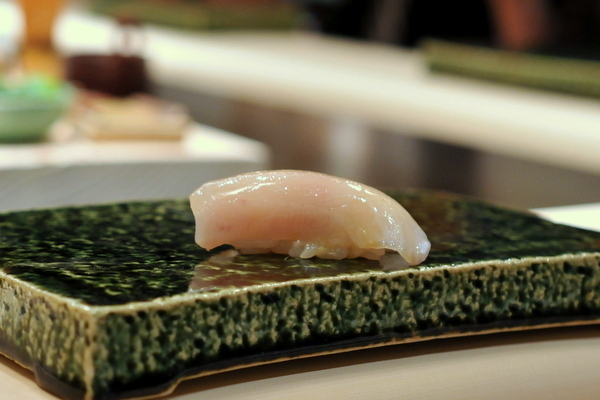 The heat combined with the fish's high fat content results in a pungent smoky gravitas that was absolutely mesmerizing especially with the fragrant contrast of the shiso. 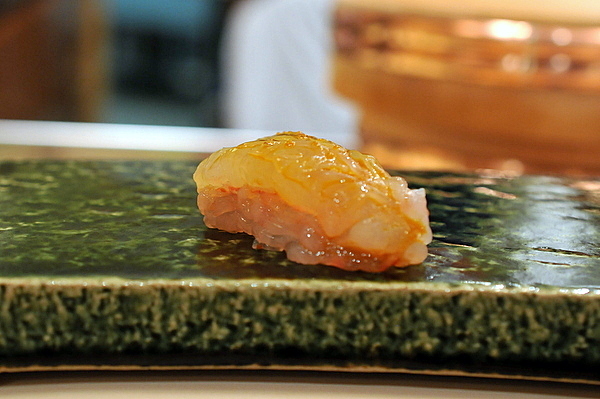 Urasawa-san originally planned to serve us Shiro Ebi, but since it was too wet he went with live Amaebi instead. After deftly shelling the shrimp he created a sauce from the innards. The sauce imparts a metallic tang to the crisp flesh and though I've come to appreciate the flavor it was a bit much for some of my companions. 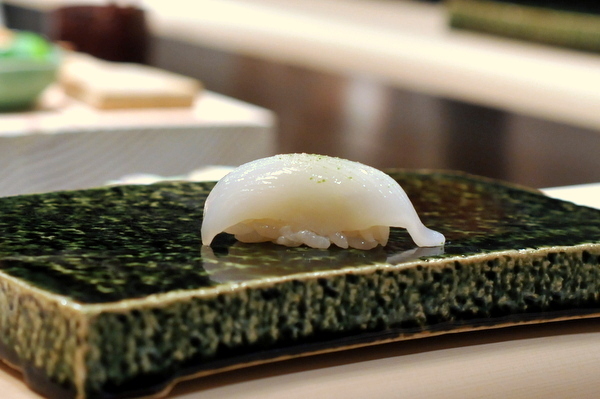 Urasawa's abalone nigiri always comes lightly scored to tenderize the meat. 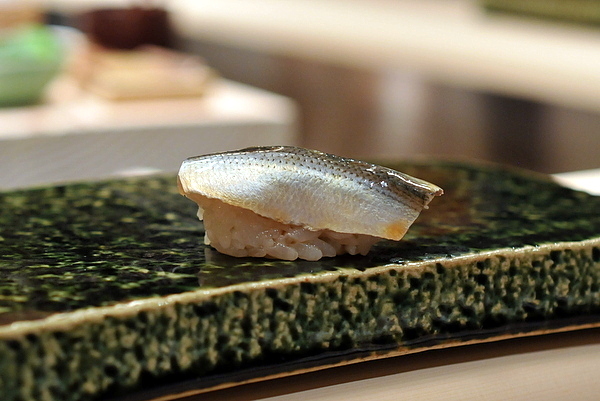 The result is a texture that is firm but yielding and not overly crunchy. One of my companions doesn't eat raw abalone but even she found this piece enjoyable. 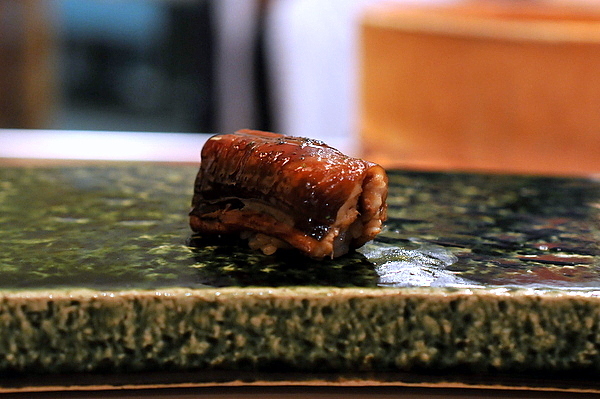 The anago was smoked on a charcoal grill in the back before Hiro layered on a a thick dark sauce. Despite the sticky sweetness of the sauce, the eel had an earthy weight as well as a countervailing levity from the citrus zest. 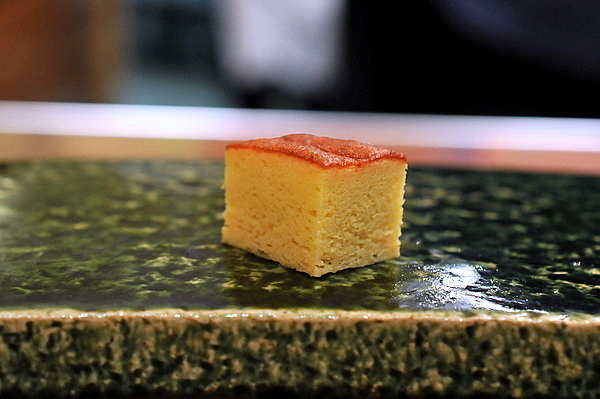 I've never been a fan of traditional Tamagoyaki, but Urasawa's preparation is more like a sponge cake, dense and sweet with a more subdued egginess. 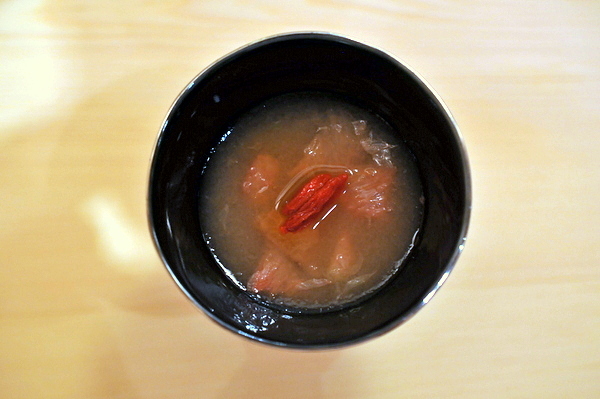 The first of our two desserts was a bracing jelly made from fresh grapefruit. The floral astringency was a bit intense but effectively cleansed our palates any remaining fishiness. A bit grittier and more rustic than typical ice cream the concentrated essence of sesame is always lovely while the summer truffles added an ephemeral earthy musk. The meal always ends with two types of tea first up was a bitter frothy powdered green tea. 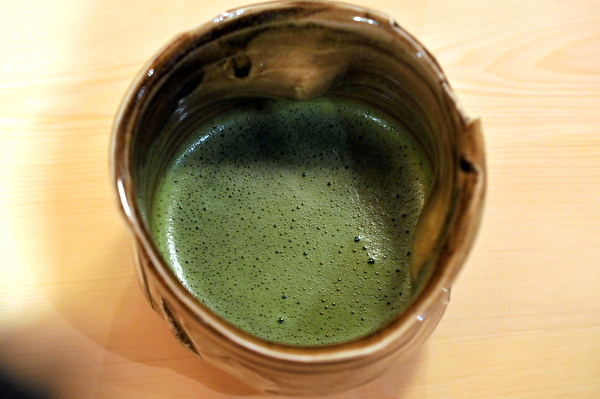 All good things must come to an end and the roasted green tea marks the end of our meal at Urasawa. Previously the tea was bottomless but this time around we were each served two cups which to be fair was more than enough. Urasawa never fails to impress; even though this is my seventh visit, there are still new heights of culinary wonder to be found and even repeat courses can feel new when viewed through the light of an evolving palate. 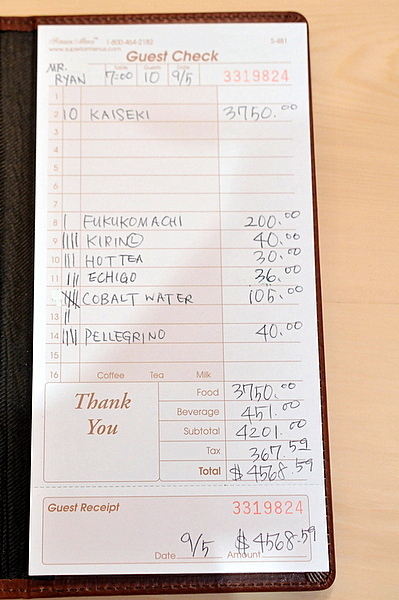 One thing I've noticed during my last two visits to Urasawa is that the meal has become markedly shorter. I'm not sure what has brought about the change but regardless Urasawa remains the premier culinary experience in LA. Haha remember foie is illegal in CA. Is the meal shorter because he's serving less courses? Or is he rushing you, a la Jiro? Fewer courses. Previously it was always above 30, but the last couple times its been in the high 20s. I suspect we could ask for more but he didn't offer so we didnt ask. Are reservations pretty straight forward here or do you need to know someone (like for Secret Beef Place)? Its a straightforward reservation, but if you want the entire restaurant you may need quite a bit of lead time depending on your flexibility in dining dates. Strange. 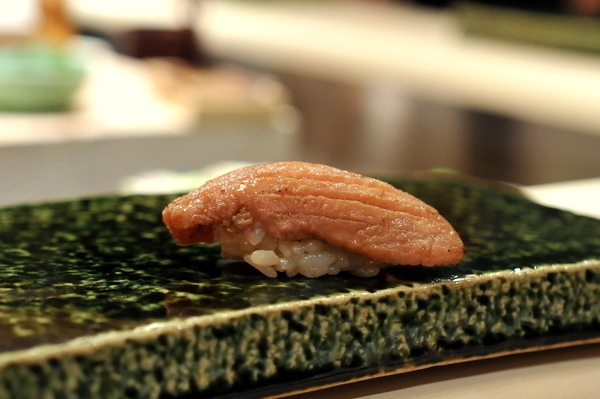 No beef and markedly less nigiri. Did you happen to discuss this with Hirosan? The beef is easy to explain, it is still illegal to import Japanese beef. Didn't ask about the reduction in sushi. I do suspect if we asked for more we would have gotten it. ryan, they lifted the ban on importing japanese beef in August. Hopefully we'll start seeing it around again!